In today’s Times, Michael Cieply reports on the strange reaction to the trailer for next summer’s Cowboys & Aliens, which has been unintentionally drawing laughs before screenings of Harry Potter. 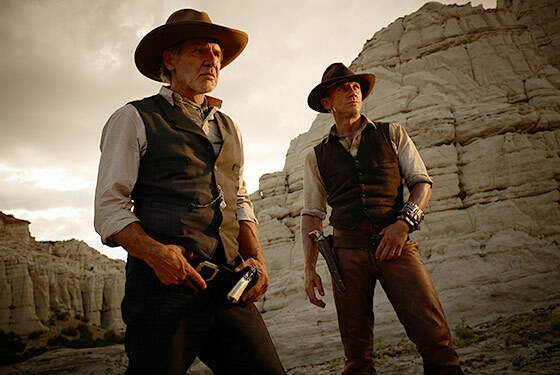 Universal is concerned, because of the film’s silly title and genre-mixing premise, that audiences are expecting a comedy instead of the joyless mash-up of Unforgiven and Alien that C&A apparently is. So how — apart from the movie’s already very somber trailer — can they better convince us of its “deadly seriousness”? Remix some Inception-style horns into the score? Give Daniel Craig’s character Parkinson’s? Cast Mo’Nique as Harrison Ford’s abusive mom? Your suggestions are appreciated, we’re sure.